NobleHour is attending the National Service-Learning Conference (NSLC) as a sponsor for the fourth year in a row. The 26th annual NSLC will be held in Washington, DC on April 8-11. This year’s theme, “More Powerful Together,” emphasizes how making meaningful connections increases the effectiveness of service-learning. This event brings together educators, students, nonprofit organizations, and community members to discuss how they can make impactful change through service-learning. Participating in workshops, listening to guest speakers, and engaging in a day of service will expose attendees to the tools, resources, and solutions they can use in service-learning. Although those in attendance will represent a diverse group of people, they share a common goal. They hope to improve their schools, communities, and world by empowering young people and encouraging them to take an interest in the issues around them. Fueled by this passion, the conference will examine current issues and how collaborative efforts are a necessary component of the solutions. Everyone has ideas that can improve our world, but learning how to translate ideas into actions is a daunting challenge, particularly for young people. Service-learning brings young people together to share their knowledge and hope for something better. It is through these experiences that they can supplant problems with change. The NobleHour team feels a deep connection with the NSLC because our roots are in service-learning. 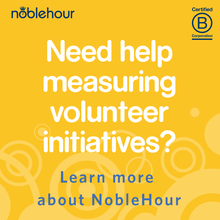 NobleHour began as a tool built specifically for volunteering and service-learning. Then a high school sophomore, Callahan Fore founded NobleHour in 2005 as a simple database where students could learn about volunteer opportunities in their communities and organizations could find volunteers. The site grew to include all of service-learning's best practices and a complete suite of tools to encourage students to explore new interests, initiate connections, track and record engagements, and gain real-world experience while contributing to a larger cause. The NSLC is one of many initiatives organized by the National Youth Leadership Council (NYLC). NYLC is an organization that promotes, supports, and facilitates service-learning as a method of creating “...a more just, sustainable, and peaceful world.” With the help of its many sponsors, such as NobleHour, the advice of its Youth Advisory Council, and partnerships with schools and organizations, NYLC advocates for service-learning by supporting educators and young leaders. The Youth Advisory Council (YAC) provides NYLC with a youth prospective. The YAC is composed of young leaders recognized for groundbreaking achievements in service-learning. These young people go above and beyond when they volunteer, found non-profits, and engage in social entrepreneurship. They bring their experience to advise the NYLC on how service-learning programs can be more effective in encouraging young people to begin acting in their communities. One such program is Project Ignition, a campaign to improve motor vehicle safety awareness. According to NYLC, car crashes are the number one cause of teen deaths, and Project Ignition hopes to educate young people on driving safety. Project Ignition is designed with service-learning in mind by making this a youth-led effort. Students combine service to their communities with academic lessons that analyze how and why culture contributes to unsafe driving. At NSLC, most of these participants will be students from all over the country bringing their ideas, big or small, for how to improve their world. These young change makers represent a future brightened by collaborative efforts. The NSLC is a spirited and meaningful event powered by the energy and open minds these young people will bring. If you are attending the NSLC, be sure to stop by the NobleHour booth to say hello and pick up a free water bottle! Make sure you to follow us on Twitter, Facebook, and Instagram for updates, and follow the hashtag #mpt15!